Mirrors can make such an impact on a space, but how do you decide where to put them? It feels a little more obvious which spots in our home would benefit from prints or art decor, but mirrors sometimes feel like a harder category. If you have your eye on a beautiful mirror but are a bit unsure about mirror placement in your house, we’re here to help! 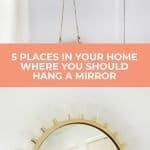 This post is partnered by High & Mighty, who not only are we working with to share the five must-have places for mirrors in your space, but to announce a fun giveaway! Check out the details at the bottom of the post for your chance to win a fun prize package! 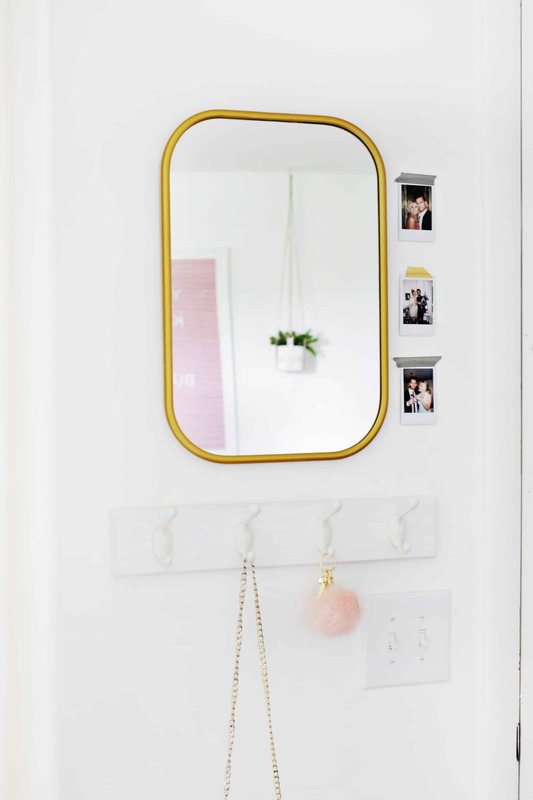 Since mirrors can be some of the heavier and more fragile items in wall decor, you also want to make sure that they are hung securely as well and we have a trick for that too! High & Mighty’s line of wall hangers for various weights and sizes makes installation a snap. Their “Place. Push. Hang.” method of installation (which is great for hanging small and heavy mirrors) means no tools needed, and they also have other accessories like hook rails and floating shelves with that same easy installation process using just your thumbs. These accessories look great paired with mirrors too! The Bathroom: OK, let’s get this easy one out of the way. 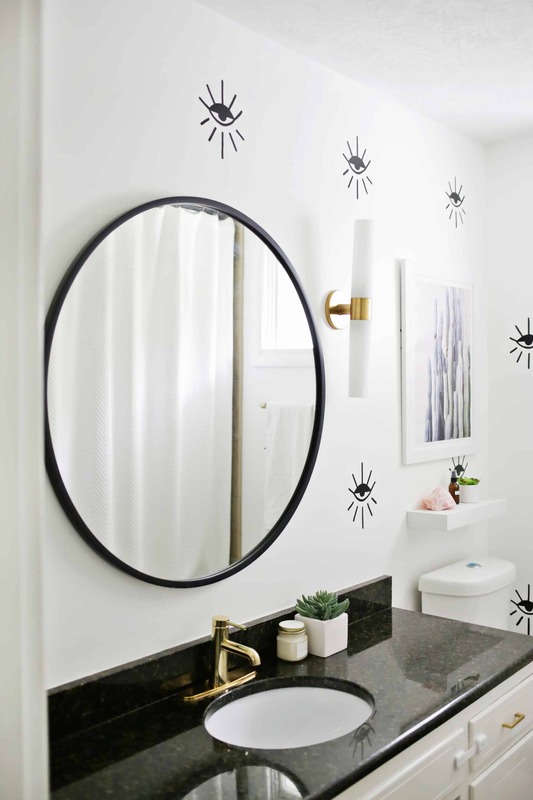 We all know that you should have mirrors in bathrooms to see what you’re doing while you style your hair or put on makeup, etc., but here’s one tip to get the most out of your bathroom mirror experience: I find that lighting is by far the most important thing when it comes to bathroom mirror setups. If you’ve ever been in a bathroom where they have awful lighting, then you know that moment of “Hmm, I didn’t think I looked terrible when I left the house, but I guess I do!” I find that soft diffused lighting (lighting that has a white or frosted glass rather than clear glass or exposed bulb) which is placed on both sides of the mirror will give you the most flattering results. The worst placement would be a single fixture with an exposed bulb or clear glass that is placed directly above the sink as this will throw all sorts of weird harsh shadows onto your face and make it look like you are in an interrogation room down at the local police station—no good! I remember going out for a nice dinner at a cute restaurant here in Nashville and I was surprised at how bad the lighting made you look in the bathroom, even though all the decor was stylish. No one wants to be out on a date, go to check your makeup sitch and feel blech just because of bad lighting design—it makes a big difference! I switched out the lighting location in this bathroom from overhead to white glass fixtures on both sides and it made a huge difference. In addition to having hangers for all your wall decor needs, High & Mighty also has floating shelves that have the most amazing way to hang them perfectly straight the first time. You simply place a strip with stickers and a small level that come in the box with the hardware onto your wall (so you know for sure that it will be straight with the addition of the level) where you want the shelf to go, push in the hardware with your thumbs, and hook the shelf on top—done! The other great thing about these is that I’ve bought and returned floating shelves several times before because they never sit tight and flush to the wall, but these totally do, which was a pleasant surprise. The Entryway: I love having a mirror in an entryway in my home. It’s a great spot to check makeup before you leave the house or catch any toddler hair clips that you forgot were lovingly “styled” into your hair earlier that day. This house doesn’t have that half-hallway setup that you may traditionally think of when you hear the term, but I consider any area that’s near the door where you hang your coats, keys, or purse to be the entryway. Having a hook rail, like this High & Mighty one, is super helpful to keep all your items organized and together in one spot. The “Dark Wall”: We all have at least one of these spots in our home (or maybe one in each room!) that’s a little darker than we would like and hanging a mirror is a great way to bounce some light from the rest of the room onto that wall. We have high small windows in our bedrooms, so hanging a mirror on the opposite wall higher up was a great way to lighten that wall and reflect some of the light that comes from the other side. This also works especially well when you have light-colored walls (a big help for small or dark rooms) as that can also help to bounce the maximum amount of light around a room. 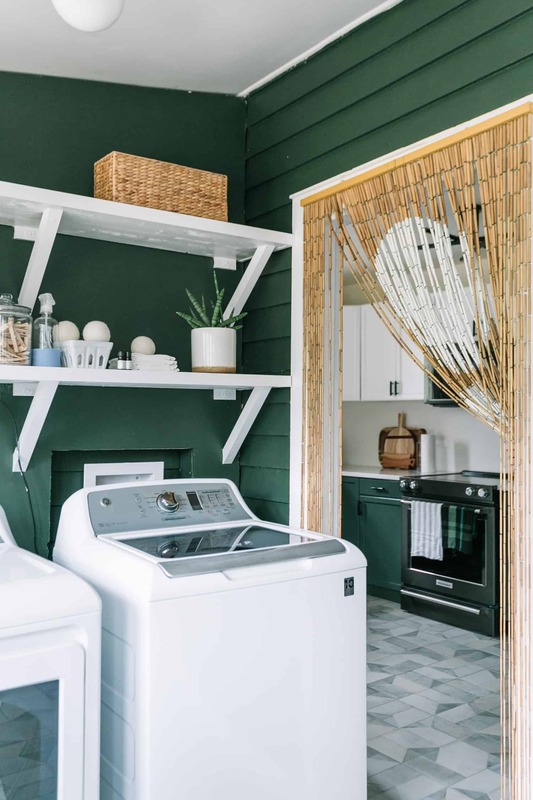 If you’ve ever painted a small space to change it from a dark to a light color, then you know how much brighter the room can be with just a change of paint! The Baby/Kid’s Room: If you don’t have kids, you may be thinking, “Really? Why in the baby’s room?” but let me tell you, it’s a super helpful addition to a kid’s room. For one, you can use it to play games with younger babies/toddlers like peek-a-boo by pulling them in and out of sight of the mirror, and I’ve used it a million times when trying to check if my daughter was asleep or not when she was lying over my shoulder. It’s a good decor choice and super useful. The Dressing Area: This area may also seem like an obvious choice for a mirror (and a full-length one if possible), but I have two recommendations for you here. First, try and place your mirror as close and easily accessible to your closet as you can. In my last house, I decided to have my mirror on the outside of my walk-in closet door (man, I miss that closet!) because the lighting was better, but since the mirror was on the outside of the door I would constantly have to close and open the door to look at something, get another option, look at it, get another option, etc., and it was soooo annoying. In hindsight, I would have found a place in the closet to put the mirror, even though the lighting wasn’t as pretty, just to make the getting dressed process easier and a little faster too. Now you can see my mirror is directly next to the closet for easy outfit decisions. 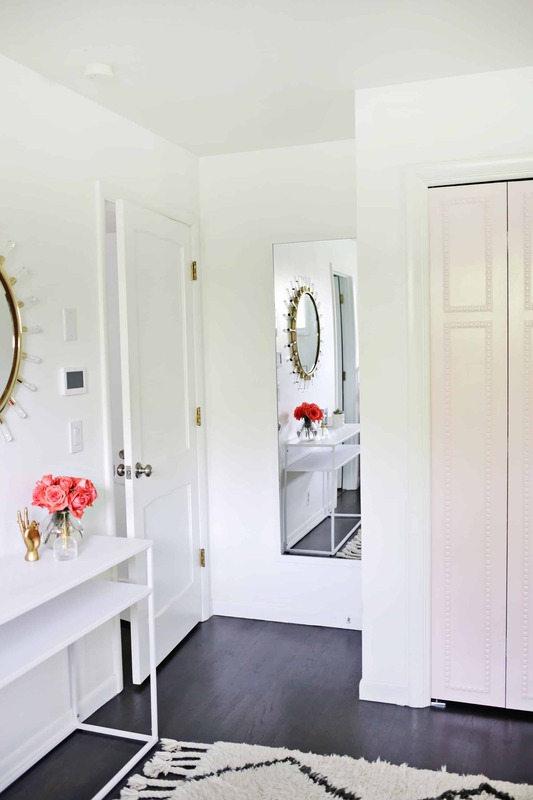 Second tip with full-length mirrors is that if you are short on space, you can make your mirror do double duty by also being a hidden jewelry cabinet to save on space and minimize clutter. Suuuuuch an organizational life saver! I have always wanted to try a hidden jewelry mirrror. Two great products in one. I like the black flat floating shelves. I also like the wall hangers. What a great idea! Would love to try the wall hangers with some decor I have been waiting to hang up! Love the 36” floating shelf for my dining room! white floating shelves all the wayyy! Some of those floatings shelves are exactly what I was just saying we needed for our Funko Pop collection! This is perfect! We just moved into a new apartment last month and it doesn’t have an entryway closet… The black hook rail with nickle finished hooks would be great for hanging jackets and purses! Would love to try the 36” black floating shelves in my sons room! I love the white floating shelves for my brand new home!! That floating shelf looks Iike a total game changer. One of the most frustrating things about putting up a shelf is that it never sits flush to the wall or level! I’ve been helping a friend decorate her new apartment and we keep joking; how many people does it take to hang a level shelf?! A couple extra holes later and it’s still not level. I’d love to try this floating shelf. I’m starting to run out of a surface space in my house and thought it would be fun to add these in! The floating shelves for sure. I have spots for the 24″ in my son’s room and the bathroom could use a couple of the 18″ now to find them in my area!! I need the 18″ White Beveled Floating Shelf for my bedroom – I got an adorable custom unicorn neon lamp that needs a pedestal to shine on! Man, this is perfect timing as I am moving into a new apartment at the end of this week! I’ll be looking into getting the floating shelves and hook rail for sure!! What a fun giveaway! That gold & lucite mirror is INCREDIBLE!!! Hanging pieces will always be the death of me so I’d definitely love to try their wall hangers!! I like how easy these products look to install. I’d love to try out the 18″ and 24″ white floating shelves. Floating shelves would be such a nice, clean look to add to my home. We bought an outdated 70’s home and want to do so many things with it. Thank you for the suggestions! I want lots of mirrors in my home and can’t wait to put these into practice. Oh man, I’d like to try 90% of their products, but especially the floating shelves – our 1906 home has mostly plaster and lathing walls and hanging things is a complete nightmare. The plaster even crumbles around wall anchors! So this seems like the perfect solution to our woes, and I could finally hang some shelving without worrying that it’s going to come crashing down on my kids. I would try the floating shelves or the hook rails! Both would be perfect in different spaces in my home! I would love the rounded mirror! I need the high and mighty floating shelfs to display decor under a mirror! I’ve needed this post for so long!!! I love having mirrors in our home, I just never know where to put them. Thank you for all of the tips and tricks! I am so in need of the Wall Hanging for 60 lbs +! I have two sets of super heavy mirrors that I am dying to hang up; but the places were we want to put them, there’s no stud! So they’ve just been sitting on the floor. The wall hanger would be amazing! Would love to try their floating shelves…definitely bought some duds in the past! 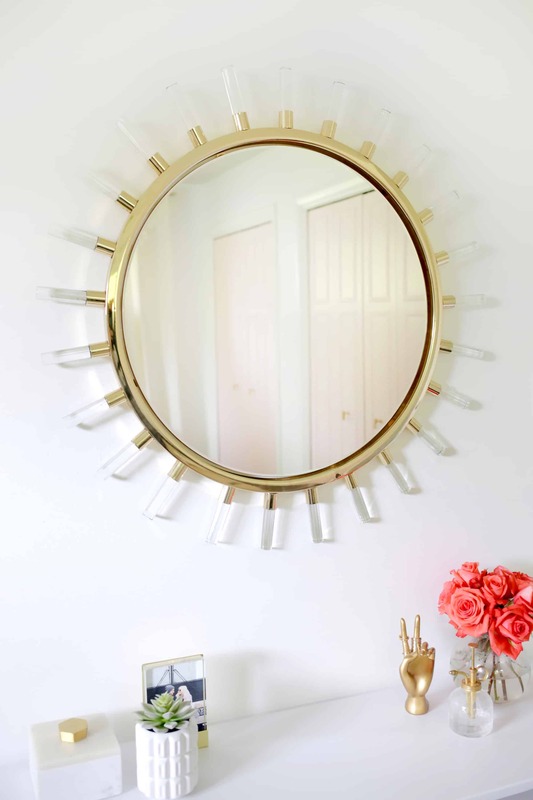 On a gloomy day like today I could use mirrors in every room of my home to help bounce light! The High + Mighty products would be great to try. Especially the coat hook one. I love the floating shelves! I’ve been wanting to put in floating shelves above my desk, and their flat white shelves would be perfect for my space! And then there’s also that stack of framed artwork that’s currently just leaning on the floor . . . I would love to use the wall hangers to test out a gallery wall! We bought a house this summer that has no over lighting in the living room and only 1 window. I’d love to try the hangers to hang a mirror in there to try and brighten it up! I would love to try the floating shelves! I would love to try their wall hangers and some floating shelves for my office! Defintely would try their floating shelves! I have so many crystals and photos I would love to display. I love mirrors so much! They add such a fun pop and light to any room!! I love those flat white floating shelves, too! I have been eyeing their products! Oh man, it’s a toss up between the hook rails (for my entryway) and floating shelves (for my bathroom). I almost always mess up hanging things and this would be a lifesaver! the floating shelvesssss soo pretty and easy! I just bought a great mirror from an antique store for the bedroom. That 40lb hanger is just what I need! I’d grab a 24″ floating shelf as well to hang beneath it. Floating shelves for sure!!! Redecorating the (zebra print) room I’ve had since I was a child with some inspiration from your last pink/white room makeover. Would be so cute for some succulents! Those floating shelves look amazing! I love these mirrors!!! Id love to try the 36″ White Flat Floating Shelf in my foyer! I love the 18″ white flat floating shelves. I’ve been looking for something just like that for my bathroom. Thanks for the giveaway. I’ve been wanting to hang a floating shelf in the powder room for a long time, but have had decision anxiety for fear of tearing up the wall. These look like a great option! I would love to try some of those floating shelves! Love the floating shelves, particularly the flat white ones! I’ve been putting off hanging up some shelving in my rental, mainly because I’m so nervous about them being straight, actually holding things up, etc., but the ones from H&M looks like it solves all my worries. I love all the mirrors in your space! They’re beautiful! The floating shelves are top on my list! Love their simplicity and how easy these look to use. I would love to have some floating shelves for my living room! I definitely would love to try the wall hangers!! We are moving into a rental soon and these sound perfect! The floating shelves would be amazing!! I’m definitely going to try the hooks for my artwork! I thought I was all but lost to blank walls when it came to my new apartment!!! I was SO happy to see this piece! For the last five years since my husband died, I’ve been living in China as a volunteer teacher. A Chinese teacher and I have been visiting folk artists in our area so I have collected a few” treasures” to display when I return home AND I’ve wondered: HOW in the world to do it! Now I know…. the WALL HANGERS and HANGING SHELVES! Thanks for this great piece. I had NO idea such products existed. It just so happens that last night, I shattered my bathroom mirror while updating my bathroom, so those high weight wall hangers would really save the day for me! Love the flat floating shelves- I want them in every room! I love the flat floating shelves – I want them in every room! I’d love to try the floating shelves! I could definitely use some easy to hang floating shelves! I would like to try the floating shelves. Like you-I’ve not had good luck finding ones that stay true to the wall-this is exciting that these do. Ooh! So many opportunities for our new home! Floating shelves in the bathroom and hooks in the entry would be my first choices. Great tips! I would love to use the white flat floating shelves in my home! definitely the 20lb wall hanger. been dreaming of floating shelves foreverrrr (for my future home)! 18″ White Flat Floating Shelf is what I’d buy. The way it “floats” is clean, sharp, and magical. Thank you for hosting this giveaway, Laura! These products look awesome! Definitely adding some High & Mighty hooks to my cart on Amazon. I absolutely love the look of their flat floating shelves in the espresso finish! I love the all white hook rail with white hooks! I would love to try the floating shelves !!! The 40 and 60 lbs wall hangers look like they make hanging heavy art a breeze! I want to try them! I’d love to try to floating shelves! I feel like they would help create much more storage room in my little studio! 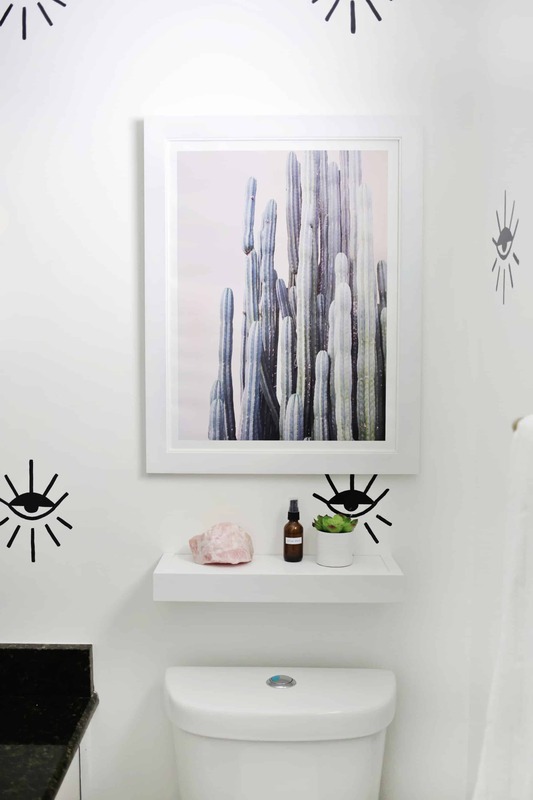 That 18″ white beveled floating shelf would be PERFECT just how Laura styled it in the bathroom below art but above the commode. !! The key rack would be perfect by my door! I loved your ideas. Especially fixing mirror in the kids room. I used to play peak-a-boo with my babe usually. Its quite exciting. Great job, Laura, so helpful and you have such a beauty of a home! I’d love to try the hook rail. Thanks! Definitely liking the floating shelves – appreciate the different design options. Those wall hangers seem pretty easy to use as well. I always love a good solution for multiple ‘how do I hang this’ problems! I love the flat floating shelves! I’d love to use them all over my house! I like their floating shelves, especially the flat front ones. Thanks for a neat giveaway! I like the mirror with a hidden jewelry cabinet and the floating shelves. I love the idea of bouncing off some light with a mirror in dark places! I can’t get enough of floating shelves, I think that flat white one would be perfect in my bathroom! Your post is very timely. I have this HUGE mirror that needs to be hung but its not on studs so i could really use one of their wall hangers. And mirror in the baby room to check if they are asleep, genius! Oh I definitely need some new hooks in my Montessori toddler community! These look awesome! This decorative wall hangers seem perfect! Would love to try them out! I would love to try the floating shelves. Our space is small and these would help add a decorative element without taking up lots of space. I LOVE the idea of floating shelves that are so easy to hang the first time and actually sit flush to the wall-it’s always been my hang-up with other floating shelves (no pun intended-ha!). I would totally go for the 36″ white floating shelves. I would love to replace the IKEA mirror in my bathroom! I would love to get the 27″ white hook rail for the entry area near my side kitchen door. It currently has a bookcase to hold all the random stuff, but I really want a bench and hook rail there. Oh and a mirror would be perfect there! Having lived in rentals for years, the wall hangers are perfect! They make smaller holes which is amazing ! I would definitely use that and the floating shelves! Definitely the floating shelves for my bathroom and also for my office. I LOVE the white beveled floating shelves. It’s so classic. I’m already dreaming of all of the little items I collect while traveling I could put on them! The floating shelves would be so handy to have around! I love all of your mirror choices and the tips for where to put them. Ooooh! I would love some floating shelves for my succulent collection! 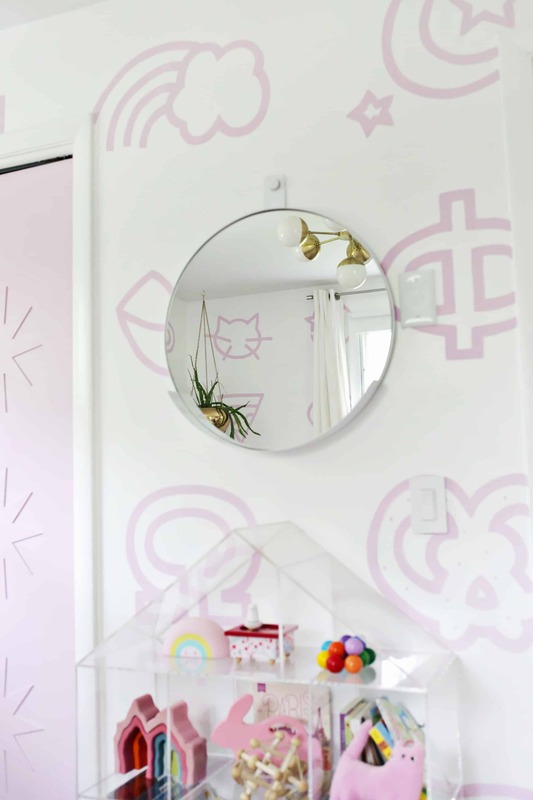 My baby girl knocked down the mirror by her changing table, and this looks like a great product that would be more secure and help motivate me to try again with mirrors in her room! I would love to try the floating shelves in my new home! It’s 150 years old and has NO storage space. I want to try some floating shelves! I have a really small bathroom and the 36” floating shelves could create some storage without taking up space I don’t have! I’ve been very curious about the wall hangers. But we definitely need some entryway hooks for kid coats. Hidden jewelry mirror!! Floating shelf !! Everything! Floating shelves, wallbhooks and hangers could all be used as I wrap up my house remodel. Loooove the floating shelves! I’ve had the same problem with others I’ve bought, I can never get them flush with the wall grr. Can’t wait to get this little modern day miracle and see how it works for myself! I would love to try the white floating shelves for all my plants! That or the key hooks to organize my entryway that I’m constantly losing my keys in! Would love to try the wall hooks for some artwork I have that is a bit heavy! And a decorative hook for my heavy computer bag. Love how easy to install everything they have is! I would LOVE the black floating shelves and a hook rack! So helpful for keys and purses and even dog leashes. Alk the floating shelves! I can never get them level! Desperately in need of the balck flat floating shelf for above our guest bathroom toilet! The floating shelves! My youngest wants some in her room, and these ones look amazing and so easy to hang. I would love some floating shelves for my nail polish storage! I love all of these ideas. I wish I would have thought to have a mirror to check if babes were asleep on my shoulder. I need to get some of those floating shelves ASAP. 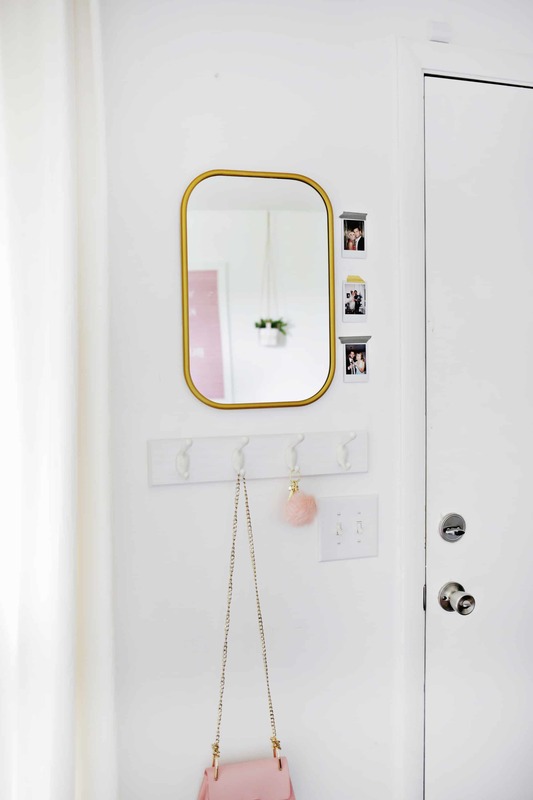 I love the idea of having a mirror, with a floating shelf or hooks under it in my entry way! I need so many floating shelves in my life. The floating shelf would come in handy in our small nyc apartment where space is limited! Ooooh, I love the floating shelf. I’d love to get a longer one for my room! I’ve always used mirrors for their ‘real’ purpose so I only have one in my dressing area. But seeing this post has opened my eyes that I ~do~ need more mirrors in my house. Like the one in the darker area, that’s really brilliant! I would love to try the wall hangers and the white floating shelves! Such a cool idea! I love all things high & mighty. Need some of the floating shelves now. I love hanging alternatives for rentals. I use command strips and the work well for pictures and light items, but the heavier items like mirrors I haven’t been able to hang. Now that I’ve seen your product I just have to have it! I’ve been longing to hang a heavy mirror and now I can! I really love that mirror with the lucite ends, where did you purchase it? I’m very interested in trying out the 36 inch shelves for the bathroom and the wall hangers ft. Or around the house! I would love to try the floating shelves. They would help out a lot in my bathroom. The wall hangers FOR SURE! Pictures frames, art, mirrors… so many things to hang in our new house. 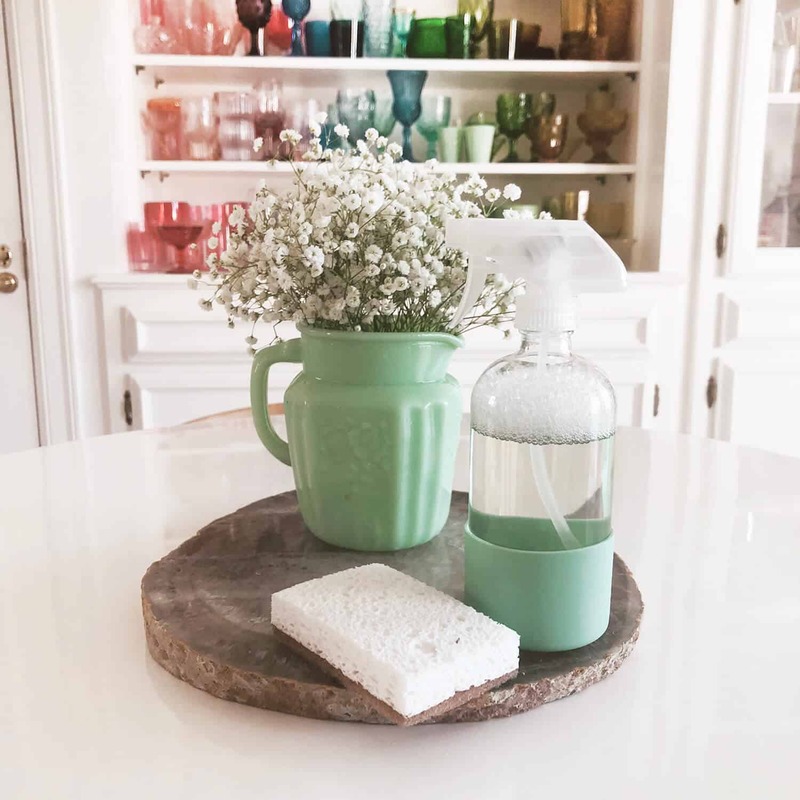 I’d also like to get my hands on some of the floating shelves just like you did in your bathroom – great landing spot for some necessities and pretties like a candle. I want the floating shelves and I’m moving into a new apartment and totally need them! 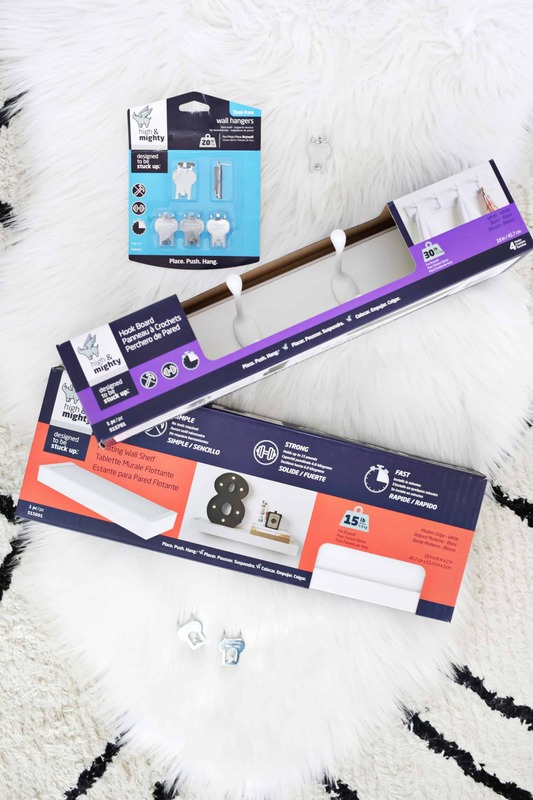 I’d love to try a hook rail … I got four of their 36” floating shelves to make one long shelf that spans my office ceiling from wall to wall for collectibles and books and it worked wonderfully! Now it’s time to tackle my entry way! I live in an apartment, where I can’t use nails or anything that would leave marks on the walls. I’d love to try High & Mighty’s wall hangers! I’ve just moved into a new place and could use any and all of these products! I’m most in need of hooks in the bathrooms and have a number of heavy mirrors and framed posters to hang! I would go with a hook rail—I’m dying to put one by our doors as a catch-all for coats so they don’t end up all over the house! I can think of a handful of places that would benefit from those flat white shelves in my house! I would love to try the wall hangers!! I would love the white flat floating shelves! I’m working on a bathroom refresh and those would be perfect! The floating shelves would be perfect for my rock collection! Just bought our first home and have been so anxious about hanging anything!!! The floating white shelves are exactly what I am looking for! Brilliant idea! Floating shelves by our entry way! Love to have more floating shelves! In a new home and need the storage area in my small bedroom. I was just planning out a workout corner in my home office and looking at how to include mirrors- and how to hand them — so perfect mess post to see. Going to buy. I would love to have some of the floating shelves in my living room! I love that acrylic dollhouse! Where is it from? Great article! The “Dark Wall” mirror is a really good idea to bounce light!